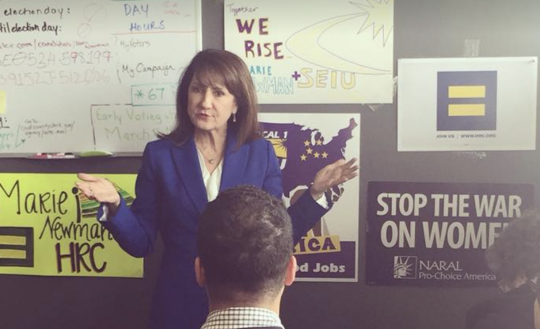 Marie Newman, the progressive challenger to pro-life Democratic Rep. Dan Lipinski (Ill.), did not initially concede Tuesday night after a narrow loss, saying she would not do so at the time because she wanted her opponent to "have a very painful evening." The Associated Press called the primary in favor of Lipinski shortly after midnight local time, but Newman wasn't ready to concede, reportedly telling her supporters, "I would like Mr. Lipinski to have a very painful evening." "I would like Lipinski to have a very painful evening," Newman says, taking the stage for the first time tonight. "So we're gonna wait." Newman was contemptuous of Lipinski on the trail, calling him a "straight-up Republican" who didn't represent the Democratic Party's values. She eventually conceded Wednesday morning, saying in a statement, "after reviewing the results, we know that we lost by a thin margin." She did not hold a news conference as she had announced the previous night. Marie Newman concedes in IL-03: "After reviewing the results, we know that we lost by a thin margin," she says in a statement. She will not hold a news conference this morning as she announced last night. "Last night, we wanted to make sure that every vote was counted, that every voice was heard. We believed there was a possibility of victory," Newman said. "I plan on continuing to hold him accountable so that every person in our district has access, opportunity, and equal rights. I hope the race we ran will make him a better representative for all of us in Congress." Pennsylvania Rep. Brendan Boyle (D.) tweeted shortly after Newman's Tuesday remarks about Lipinski that it's important for people who run for office and lose to congratulate their opponent. It was unclear if he was directly referring to Newman, however. "It’s important if you ever run for office and lose that on election night you congratulate your opponent, thank your volunteers for all their hard work, and then get off the stage. It’s not easy. I know, I’ve been there. But how you handle defeat says a lot about you," Boyle wrote. It’s important if you ever run for office and lose that on election night you congratulate your opponent, thank your volunteers for all their hard work, and then get off the stage. It’s not easy. I know, I’ve been there. But how you handle defeat says a lot about you. Lipinski, a seven-term congressman for the Chicago-area third district in Illinois, endured a fierce challenge from the left due to his position on abortion, decision to not endorse President Barack Obama in 2012, and his "no" vote on the Affordable Care Act, among other views considered heretical to the left. Newman received support from Sen. Kirsten Gillibrand (D., N.Y.), as well as Illinois Democratic Reps. Jan Schakowsky and Luis Gutierrez, in her bid to knock off Lipinski. She also had the backing of such powerful outside groups as NARAL, the Human Rights Campaign and Emily's List. This entry was posted in Politics and tagged Abortion, Chicago, Illinois, Kirsten Gillibrand, Luis Gutierrez. Bookmark the permalink.